The elite soldiers of Imperial Intelligence, Death Troopers are encased in specialized stormtrooper armor with a dark, ominous gleam. These soldiers served as bodyguards as well as enforcers for Director Krennic, a high ranked officer within the Advanced Research team of the Empire. 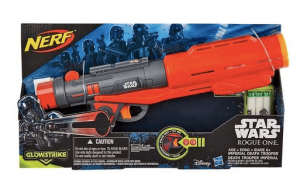 Inspired by this Hasbro has released late 2016 this Star Wars Nerf Deat Trooper blaster showcing GlowStrike innovation that develops glowing light and also charges the darts making them light up when you fire it. 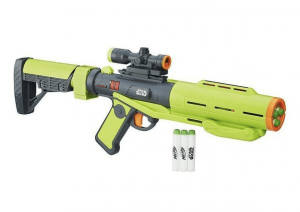 Kids can launch into stellar adventures pretending to be an elite Stormtrooper with this pump-action blaster. Designed for wannabe Death Troopers ages 6 as well as up, this blaster has a red and grey plastic and of course a Star Wars logo on the side. This cool blaster also features a tactical rail for any Nerf add-ons, one magazine clip, and also a pump-action handle. 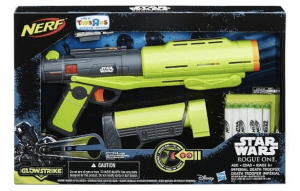 The foam Nerf darts for this gun is also special with a white with green tips, and also they have the Star Wars insignia on them. They also released one more version that features in neon green as well as a few extra accessories. This version includes a targeting scope and a removable stock to offer it a more complete blaster rifle really feel and look, which is way cooler. The Death Trooper Blaster is a large three-shot blaster, with a pump action handle to fire the gun. This model incorporated the Smart AR system, which permits the 3 barrels to be loaded independently, because the air is routed especially to the crammed barrels. So you do not have to focus which barrel fires first, which is a big benefit. The user also does not have to worry about refilling like some other blasters after every shot so it’s more convenient. The Death Trooper Blaster not just has an accessory rail for scopes, but also a connection point for shoulder stocks, which could work with any most Nerf accessories. It also has an add-on piece maybe just for aesthetic purpose, which is clipped sideways of the blaster. At the back of the blaster there is a speaker that produces the cool laser blast sound effect when the user pulls the trigger. It may sound rather annoying after awhile but I think the younger kids would appreciate it. The audios are loud and clear, as well as they include an amazing element to the product that will enhance kids’ role-playing experience. This sound effect requires 3 AAA batteries, which are included however do make sure you have spares in hand for long battles. The blaster is pretty much simple to use for any kid. Once you load the three darts provided, just slide back and forward to prime the gun and you are ready to shoot. What is interesting with this blaster is that when you prime the gun this will activate the LED light inside the barrel and will also charge up the Glowstrike darts so that’s a pretty cool feature. On the whole the priming is smooth and easy to handle, which is great. Normally the first two darts usually fires fine but after a while the 3rd dart occasionally loses a bit on the distance. On average you most likely can get about 45 to 50 feet for the shooting distance, which is kind of disappointing considering the standard 70 feet that you might get with the current Nerf blasters line up. For a young 6 year old that can be entertained by the sound and lighting effects this may be a cool choice. And if you are a Star Wars fan then getting this just to have a full complete collection would make sense. However, with just an average performance in terms of range and also high pricing of $30 to $35 for this piece it may not be a good option for hard-core Nerf fans where range and dart capacity are crucial elements. Unless of course if you plan to have a night battle then this can be a cool secondary weapon to carry around.